Benefits of Soft Washing Your Home - Pro Wash LLC. 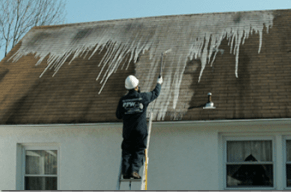 Over the last several years, the exterior cleaning industry has adopted a relatively new practice for removing organic and atmospherical debris from vinyl, brick, stucco and almost any other surface. Since the invention of the high pressure pump system we all know as “the pressure washer”, the standard practice has been to spray a concentrated stream of water at a given surface to remove contaminants and restore the surface to its original condition. This method does work sometimes, however it is VERY labor intensive and requires the operator of the pressure washer to be close to the surface being cleaned. To put that statement into perspective let’s use a common 2 story brick and vinyl siding house as an example. The lower sections of the home can be easily cleaned with high pressure spray. 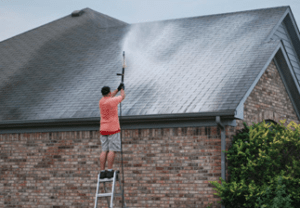 Even the gutters can be pressure washed by using wand extensions, but what about the peaks on either end of the house or the rear gutter, which is 25′ from the ground? To finish the job completely, ladders or scaffolding would have to be used to reach the higher areas of the residence. Accessing the high areas is only one drawback to the “high pressure” approach to house washing. Water alone, no matter how high the pressure is, sometimes is not enough to remove stains that are commonly found on the exterior of a house. Discolored trim, siding, gutters and window frames may not come clean with high pressure water alone. Another drawback to house washing with the “high pressure” method is the risk of damaging the surface being cleaned. ANY building material can be damaged if too much pressure is used. Now that you are familiar with the process of cleaning with high pressure, let’s take a look at the process and benefits of cleaning with the “SOFT WASH” method. Soft washing is the process of applying cleaning detergents at low pressure and rinsing the solution and any contaminants off the surface with a low pressure stream of clean water. Typically, a cleaning solution for residential house washing will include Sodium Hypochlorite (bleach) and a surfactant or foaming agent. Sodium Hypochlorite is very safe and effective when used properly. It is used in the treatment of drinking water, to disinfect swimming pools and many other sanitary applications. By the time the cleaning solution is mixed with water and applied to the surface of the house, the bleach content is just a tad more than a swimming pools normal operating level. When the foamy mixture is applied to the exterior of the home, the bleach dissolves any mold, mildew or algae. Dust, dirt, spider webs, and other debris are suspended in this foamy mixture which allows the debris to be rinsed away easily with a low pressure water stream. When soft washing a home, the water stream should always be weak enough to place your hand directly in front of the spray nozzle without causing any pain whatsoever. This is probably the biggest advantage over the high pressure method because the likelihood of damaging the exterior surface of the home is dramatically decreased. Another big advantage to low pressure soft washing is that the entire home can be cleaned from ground level. A professional cleaning contractor will have the right equipment to spray the cleaning solution and clean water to heights of up to 50 feet from the ground. This reduces the overall time spent on the project and reduces the likelihood of the home being adversely affected by ladders and wobbly extension poles. Due to the properties of the cleaning solution being used, the end result of the cleaning is often superior to the end result of cleaning with high pressure water alone. There are several scenarios where organic growth on certain materials WILL NOT be removed without the use of a sodium hypochlorite cleaning solution, no matter how much pressure is applied. Take a look at some of the key reasons why the SOFT WASH method is far superior to the HIGH PRESSURE approach to cleaning homes and buildings. LOW PRESSURE REDUCES CHANCES FOR DAMAGE AND WATER PENETRATION INTO THE STRUCTURE. A CLEANER END PRODUCT DUE TO THE CLEANING AGENTS. COST EFFICIANCY-REDUCED LABOR AND SETUP TIMES BY ELIMINATING THE NEED FOR LADDERS OR SCAFFOLDING. ALGAE, MILDEW AND MOLD ARE KILLED AT A MOLECULAR LEVEL, WHICH ALLOWS THE HOME TO STAY CLEANER LONGER. THE STRUCTURES EXTERIOR IS DISINFECTED AS WELL AS CLEANED. REQUIRES LESS WATER THAN CLEANING WITH HIGH PRESSURE. For a free, no obligation consultation or quote on your house or building washing project, call PRO WASH, LLC at 615-999-0104. If you are interested in cleaning the exterior of your home yourself, our highly trained staff can offer professional advice based on your equipment and skill set.